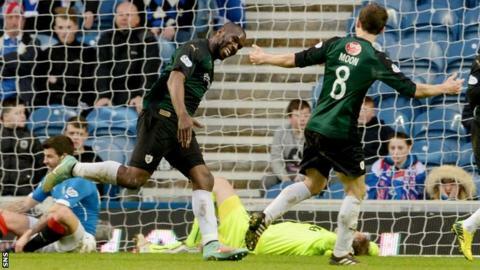 Christian Nade (left) celebrates after putting Raith Rovers 2-1 ahead against Rangers. Raith Rovers manager Grant Murray paid tribute to the belief of his team after they knocked Rangers out of the Scottish Cup with a 2-1 win at Ibrox. Haris Vuckic cancelled out Ryan Conroy's free-kick but Christian Nade's goal sent Rovers into the quarter finals. "Absolutely delighted for the players. For the players to put in a performance like that at a place like Ibrox is incredible," Murray told BBC Scotland. "Cup ties are about scoring goals and not losing goals. Yes we got pinned back after taking a great lead, but credit to the players they kept going, they got that winner and it's fantastic and they're delighted. "Coming to places like this in cup ties is huge for any football club never mind ourselves, but I think within the changing room we had to have that wee bit of belief. "There's a lot of guys in there that have played in big football matches and they stepped up to the plate today. "They were dead on their feet at the end after the effort they've put into today's game. "The guys who score the goals get the headlines, but at the end of the day we had to battle, to defend as a team, stick our heads on things because Rangers came at us late in the game." The Kirkcaldy side now go into Monday's Scottish Cup draw, which will feature just three Premiership teams. "We would be delighted with a home draw," said Murray. "We've got to let today sink in, the enjoyment of coming to a place like this and coming away with a victory in the Scottish Cup. It doesn't get any better than this."